It was just announced that one of the remnants of the former Eastman Kodak Company, Kodak Alaris, is on the brink of being sold. They say they are looking to sell part or all of its business, and its film business, in particular, could be sold to another company within the next month or two. It is sad to see that Kodak, one of the giants of the photographic industry, has fallen so far. But we must also remember that without the 35mm film, first pioneered by Kodak, the Leica might never have happened. The following article was written for the centennial of the company. In the year 1880, when Oskar Barnack was but one year old and when the Leitz company was 31 years old, a modest 26 year old bank clerk began to manufacture photographic dry plates in a rented third floor loft in downtown Rochester, New York. Today, 100 years later, that one product enterprise has grown into a worldwide organization of 125,000 employees who produce about 25,000 different products. The story is a classic success tale, the kind we recite to children to prove the merits of thrift, determination, and plain hard work. 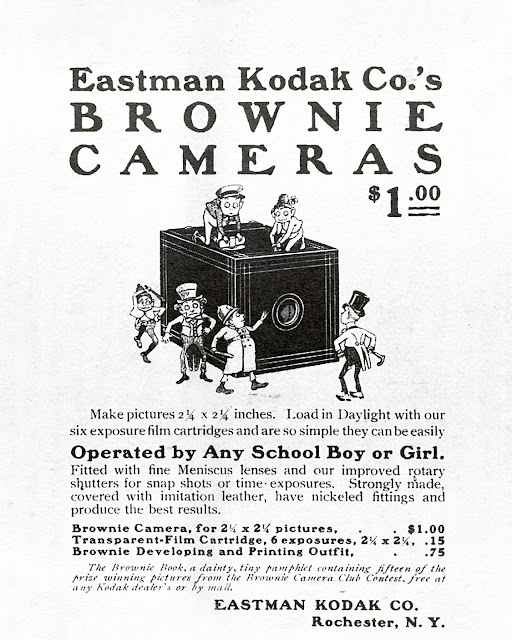 That young clerk was George Eastman, and the company that is now celebrating its 100th anniversary is the Eastman Kodak Company. It all began with plans for a long awaited Caribbean vacation trip that George Eastman hoped to take in 1877. At the suggestion of a friend, he had bought a photographic wet plate outfit to record his big adventure. That outfit consisted of a large camera, dark tent for coating and later processing wet plates, chemicals, glass tanks, heavy plate holders, jug of water; and he had to pay $5 for lessons on how to use his new equipment. In spite of the very cumbersome method, Eastman became so involved with photography that he did not go on that Caribbean trip at that time, choosing instead to go to Mackinac Island later on when he became more adapt with his new hobby. Not much later, Eastman read news from England about a new photographic plate that was dry and which did not require the messy and laborious coating and field processing in a tent. This convenience seemed so appealing that he began to experiment in his mother’s kitchen at night, while still working at the bank during the day. He was methodical and ingenious and eventually he produced a successful series of dry plates. In the course of his experiments, he had an idea for a machine for coating such plates evenly and in quantity. He took that idea to London, because that was a center of the photographic and business world. There he obtained his first patent. 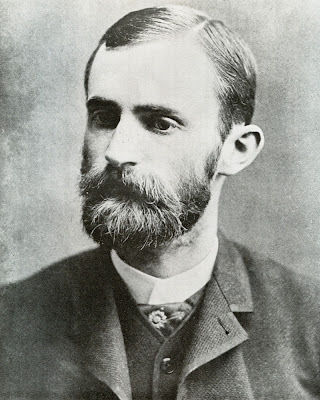 Only one year later, in 1880,George Eastman was granted an American patent for his new coating machine and he proceeded to rent a third floor loft in Rochester to begin the commercial manufacture of his dry plates, thus establishing the basis for the centennial that is being celebrated in 1980. His company was called the Eastman Dry Plate Company, which, with the addition of 14 shareholders in 1984, became the Eastman Dry Plate and Film Company. He surprised the trade by announcing film in rolls, along with a roll holder adaptable to nearly every existing plate camera. In 1889, the name was changed again to the Eastman Company and in 1892 it received the current name Eastman Kodak Company. 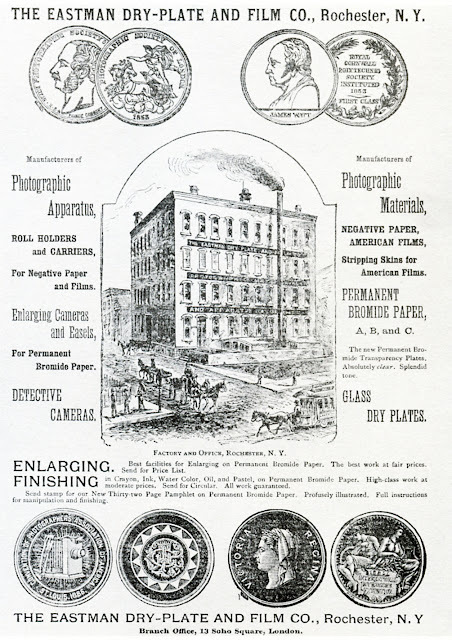 A development of special importance took place in 1889, when Thomas Edison approached Eastman to work out a configuration of the new flexible film for use in a device to go with Edison’s invention of the phonograph to make the latter more appealing to the public. At first Edison had photographed the pictures in a continuous spiral on a cylinder. But then he got the idea of using a continuous strip of film, perforated on the sides to make pictures in succession as the film moved through the camera. Prints from the negatives could then be viewed through a lens in his kinetoscope. 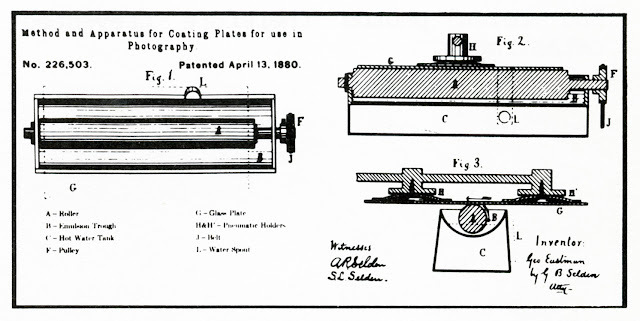 After experimenting with various widths, Edison’s English assistant Dickson had suggested 1 3/8 inches, which translates into 34.9mm and thus 35mm motion picture film was born! 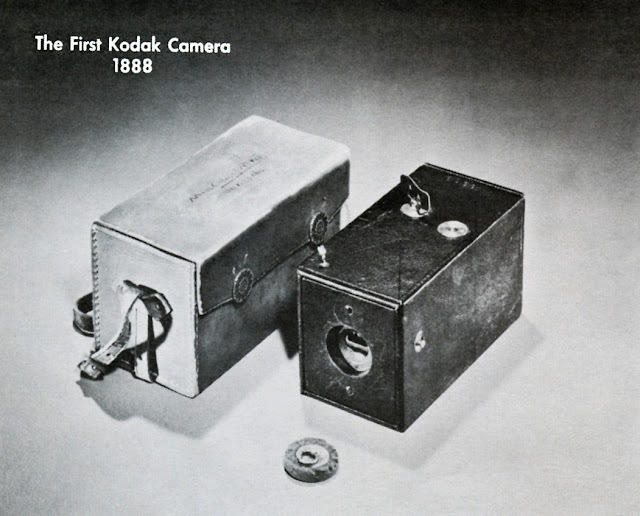 Eastman introduced his first daylight-loading camera in 1891, making photography even more convenient by eliminating the need to load and unload the camera in complete darkness, and in 1896 Kodak perfected the first positive motion picture film, an important step for the fledgeling motion picture industry. 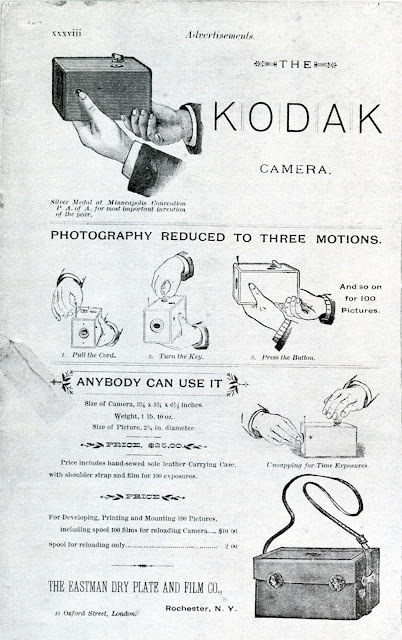 His first folding camera, the No 4 Folding Kodak Camera, had been introduced just one year earlier. At first Kodak cameras were manufactured for Eastman by another company, owned by his friend Frank Brownell, whose grandson, a senior vice president of a Rochester bank, was inspired by the handwritten correspondence between Eastman and Brownell and other artifacts that he inherited from his grandfather, and he gradually assembled an impressive collection of significant vintage cameras. Eastman built his own six-story camera works in 1893 and one of the first relevant cameras that it produced was the Pocket Kodak camera of 1895. It was partly made of aluminum, it was very compact and it was the first Kodak camera to incorporate the little red window in the back to watch for the exposure number when winding the film. An agreement was signed in 1896 to supply plates and paper for the new x-ray technique invented by Wilhelm Konrad Röntgen only one year earlier. The very popular Folding Pocket Kodak cameras were introduced in 1898, followed by the famous Brownie cameras in 1900. With their price of only $1, they brought photography within the reach of almost everyone. These principles were evident from the very beginning, as demonstrated by his very first patent, which described a machine to coat plates in quantity. He founded his first overseas subsidiary only five years after beginning his manufacturing activities. This was in London, soon followed by additional ones in France, Australia, Canada, Germany and others, leading to today’s Kodak representation in over 50 countries. Eastman was daring for his time because he believed in vigorous advertising. He chose the famous trademark Kodak and his trade dress for packaging – yellow – is recognized virtually everywhere. He favored slogans like “You press the button, we do the rest.” While such techniques are common today, they were novel in the day. He correctly perceived the enormous potential of photography if it were made accessible to the average person and by bringing out inexpensive products he met this customer need, as it would be called in today’s jargon. Another visionary act was the employment of a fulltime research chemist in 1885 to aid the development of a flexible film base. That was also unusual for those days and Eastman further substantiated his belief in 1912 by hiring the prominent British scientist Dr. C. E. Kenneth Mees to organize and direct a research laboratory in Rochester. This has proven eminently successful with countless new developments in emulsion technology. 1941 – The Kodak Ektra camera, an early 35mm camera with lever film advance and shutter cocking, zoom viewfinder, interchangeable magazine backs, a very wide base, accurate, coupled rangefinder and many other advanced features. However, it was short-lived. In order not to become a book, this article will only touch on highlights of Kodak history, bearing in mind that readers of the Barnack and Berek Newsletter [and this blog] have a special interest in matters related to the Leica camera. Therefore it seems appropriate to dwell on certain aspects of Kodak history that affect the Leica camera. To begin with, the foundation for the Leica camera was established when Thomas Edison and George Eastman introduced perforated 35mm film in 1889. Although it was intended for motion picture cameras, it became the basis for a number of still cameras and at least 11 different brands came on the market before the first really successful one appeared. That was the Leica camera. George P. Smith of Richmond Heights, Missouri, patented a camera for the 24 x 36mm format in 1912; the Tourist Multiple and Homeos cameras appeared in 1913, followed in 1914 by the Simplex Multi Exposure camera, which seems to be the first commercially available 24 x 36mm format camera. Next came the Minnigraph, Phototank, Sico, Esco, Furet, Cent Vues and Eka, most of them designed for eye level viewing and some of them utilizing unperforated 35mm film [Kodak 828 film]. Formats varied between 18 x 24mm and 10 x 45mm. The next camera was the Leica, introduced at the Leipzig Spring Fair in 1925 and it had the most fortuitous combination of features, precision and size. The introduction of the 35mm version of Kodachrome film in 1936 gave great impetus to 35mm photography. The story of its inventors is so fascinating that it could be made into a movie: Two young musicians, both named Leopold, one a pianist, son of a violinist, the other a violinist, son of a pianist, were so disappointed with the early color movies they had just seen, that they in their youthful naiveté and enthusiasm decided to produce a better color film. After years of intermittent experimentation, Leopold Mannes and Leopold Godowsky were introduced to George Eastman, who, surprisingly, did not recognize their potential and took no action. But on another occasion, they met Dr. Mees, the founder of the Kodak Research Laboratories, who was so impressed by their talent and enthusiasm that he offered them the use of the facilities of those laboratories to further their experiments if they would agree to come to Rochester. After considerable reluctance because they wished to continue their vocation in music, Mannes and Godowsky accepted the offer on the condition that it would be limited to five years. That term was stretched to eight years, culminated by the introduction of Kodachrome film in 1935, whose improved versions are still highly popular today, 45 years later. The two men eventually left Rochester to return to their musical careers, but not before receiving honorary cameras presented by Leitz in recognition of their achievement: Godowsky received camera No. 175000. Unfortunately Godowsky’s camera was stolen afterwards, but Leitz replaced it with a Leica M5 in November 1975. Leopold Mannes passed away in 1964; Leopold Godowsky and his wife Frances, sister of George and Ira Gershwin, live comfortably in Westport, Connecticut. Another item of interest to Leicaphiles is the little known fact that for a time the Leica camera’s shutter curtain material came from Rochester, where the Folmer & Schwing Company, better known as Graflex, was a temporary subsidiary of Kodak. They produced an excellent shutter curtain material for their own as well as other cameras, including Leica. Notation No. 99 of July 1941 in the Leitz camera assembly foreman’s logbook states that the “Kodak cloth” was used up with camera No. 379229 (a IIIc) and that they began replacing it with a German rubberized cloth. 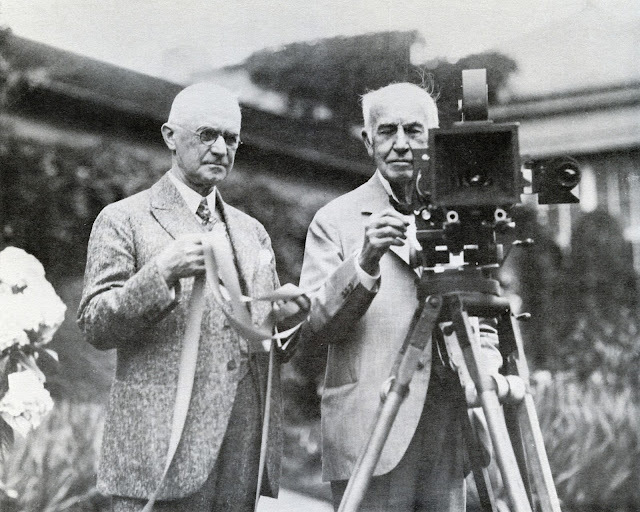 The company that started so modestly with George Eastman became increasingly self-sufficient: its own camera works in 1912, followed by a gelatin plant, a paper mill and a power plant in the Kodak Park works in 1918. The Tennessee Eastman Company was created in 1920 with the acquisition of a plant to manufacture alcohol for film base, later expanding into plastics, synthetic fibers, dyes, acetate film base and industrial chemicals. Another gelatin plant was purchased in Peabody, Mass., which now supplies two thirds of this important ingredient for photographic film, plates and papers. The gelatin used in emulsions has to be purer than that contained in such popular foods as Jello. Interesting byproducts of the company’s chemical production are vitamins which are sold in bulk to pharmaceutical companies. Amateur movies became practical with the introduction of 16mm reversal film on safety base. A Cine Kodak motion picture camera and a Kodascope projector were also introduced that year, leading to the establishment of a worldwide network of processing laboratories to satisfy the popularity they came to enjoy, which was enhanced even further with the production of 16mm Kodachrome movie film in 1935 and Kodacolor movie film in 1938. The first 8mm amateur movie film, cameras and projectors were introduced in 1932 and their lower cost made the hobby available to an even greater segment of the population. Color film technology continued to improve with the introduction of Kodacolor negative film for color prints in 1942 and Kodak Ektachrome film for transparencies in 1945. Both could be processed by the photographer himself and their quality and sensitivity was steadily improved, the latter growing from ASA 32 to today’s ASA 400. 1961 was the year of the introduction of the award-winning Kodak Carousel Projector which became widely accepted. A version of this projector made by Kodak AG in Stuttgart, Germany, is on display in the Museum of Modern Art in New York City as an example of good industrial design. Leitz introduced its first projector that accepts the round Kodak Carousel slide trays in March 1980, the RT 300, utilizing its own superb optics in a mechanism built for Leitz by the former Graflex plant in Rochester, New York. 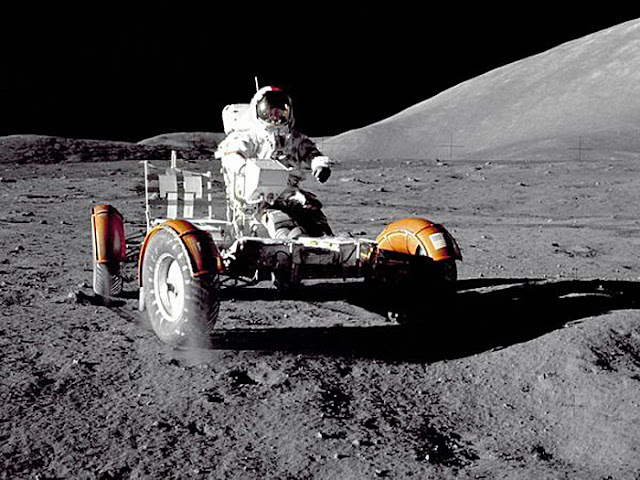 Countless historic photographs were made on Kodak film, including the first black and white photographic survey of portions of the lunar landscape, which were made with the self-contained dual lens camera, film processor and readout in the Lunar Orbiter II module built for NASA by Kodak. 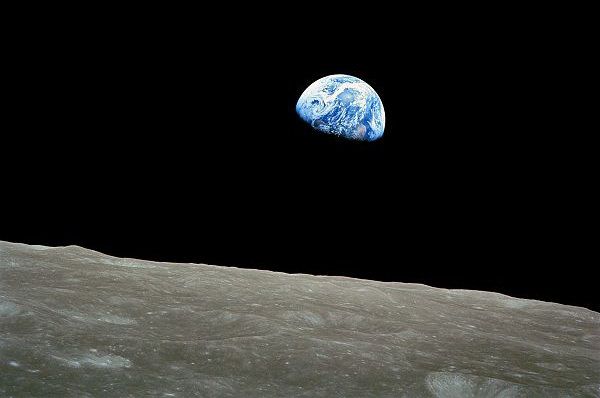 Later came even more historic color pictures of the first humans ever to set foot on the moon and the dramatic view of the earth seen from the moon. In keeping with Eastman’s philosophy of making photography easy to use and accessible to the masses, films were packaged ever more conveniently, first by the introduction of magazines for 16mm movie cameras in 1938, followed by 8mm magazines in 1940. Still photography was greatly simplified by the introduction of molded drop-in cassettes in 1963, which had notches that keyed the sensitivity into appropriately equipped cameras. These were the Kodak Instamatic cameras, whose production passed the 50 million mark in 1970. A more efficient movie cassette with similar characteristics was introduced in the form of super 8 cartridges in 1965. Amateur movies were further improved by the addition of sound capability through pre-striped super 8 film in new cartridges in 1969, along with new sound movie projectors. Amateur still photography became even handier with the introduction of Kodak Pocket Instamatic cameras for 110-size film cartridges containing improved 16mm film in 1972. All along processing and printing equipment for amateur film became increasingly efficient and highly complex, as evidenced by the introduction of a computer controlled color printer in 1974, capable of printing nearly two prints per second. In the health science field, quicker diagnosis of certain injuries was facilitated by the introduction of the Kodak RP X-Omat processor in 1965 which provided dry, ready to read radiographs in 90 seconds. In 1979 sales passed the$8 billion mark and employment approached 125,000. Meanwhile microfilm had become a major factor in information storage and retrieval, beginning in 1935 with the introduction of 35mm for recording newspapers and later checks and other bank documents. More sophisticated microfilmers evolved, eventually incorporating electronic and computer technology for high speed automatic retrieval at low cost, ranging from desk top machines to large computer output microfilmers. Kodak entered the fertile office copier market in 1975 by announcing the Kodak Ektaprint copier which produces high quality copies on regular bond paper. A year later came another milestone when Kodak entered the popular field of instant photography with the Kodak EK4 and EK6 cameras and Instant Print Film for quick, self-developing color prints. 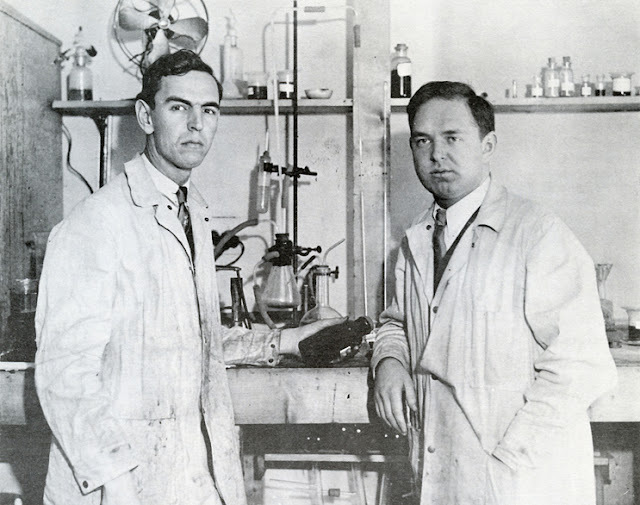 Much of the prolific flow of new products is due to Eastman’s foresight in creating the research laboratory network, which today employs 6600 persons in several countries, investing over $1 million each day in its quest for new or improved products which it turns out at the astonishing rate of nearly one new product every three working days. A single one of the original shares at the beginning of this story would have multiplied to more than 24,500 shares valued at some $1.2 million in today’s market. 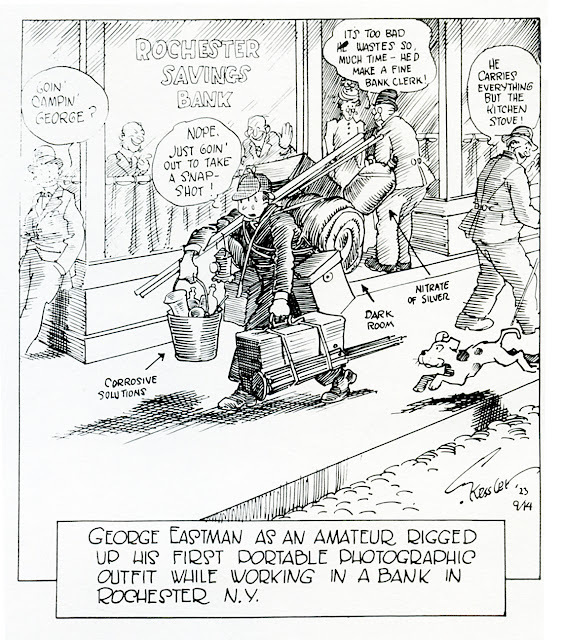 Having been denied pleasure in his hard working youth and middle age, in later years George Eastman went hunting for things he had missed, such as music and flowers and paintings, as well as outdoor life. Yet he was not ostentatious, he was a tough competitor, hard-bitten and practical in business, but congenially reticent in his home and in outdoor enjoyment. He became a great philanthropist, starting early with contributions to what is now the Rochester Institute of Technology. Under the name of “Mr. Smith” he anonymously gave $20 million to the Massachusetts Institute of Technology. He gave dental clinics to Rochester, London, Paris, Rome, Brussels and Stockholm. He supported a school of music, a theater and a symphony orchestra in Rochester. In addition to decisive contributions for a medical school and a hospital for the University of Rochester, he also generously aided the Hampton and Tuskegee Institutes. The company he founded, like any group of human beings, had its share of problems and setbacks, but its performance is magnificently positive. With such impressive accomplishments occurring at an accelerated rate, it is exciting to conjecture what its next century will bring, or more realistically, in terms of our own life span, what improvements and conveniences the next years will bring. It seems that after the centennial in 1980 Kodak went steadily downhill. Kodak still had some successes after that. Lets not forget about their Nikon based digital camera, the first with a full frame sensor and 12 megapixels. I don't know why they didn't develop it any further unless Nikon was not interested in further cooperation with Kodak because the introduced their own digital cameras. But Kodak definitely made a lot of mistakes, as did many other companies, by not realizing how much of a steamroller digital photography was to become. They tried to hold on to their film business too long and even though they had a rather sophisticated research and development branch for their digital sensors, that ultimately was not able to save the rest of the company. The Kodak we knew definitely died, and the remnants of the company are virtually unknown. I read that Kodak is making cameras again, point and shoot digital. That is not Kodak. 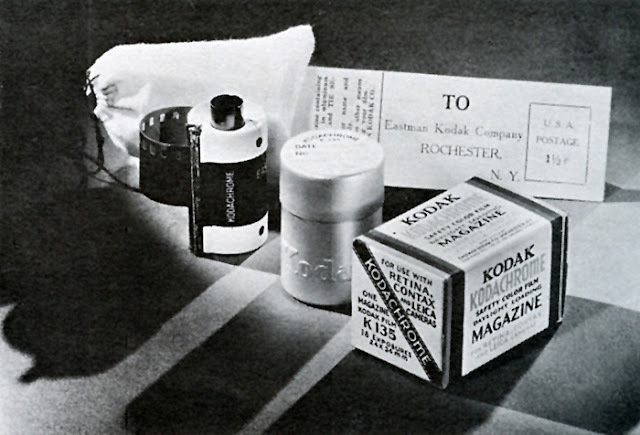 Kodak sold the rights to their name, including the characteristic KODAK logo to a far eastern company. They were making cameras with the Kodak label, but there is no connection to the actual Kodak company and I am not sure if any of their Kodak labelled cameras are still, in production. 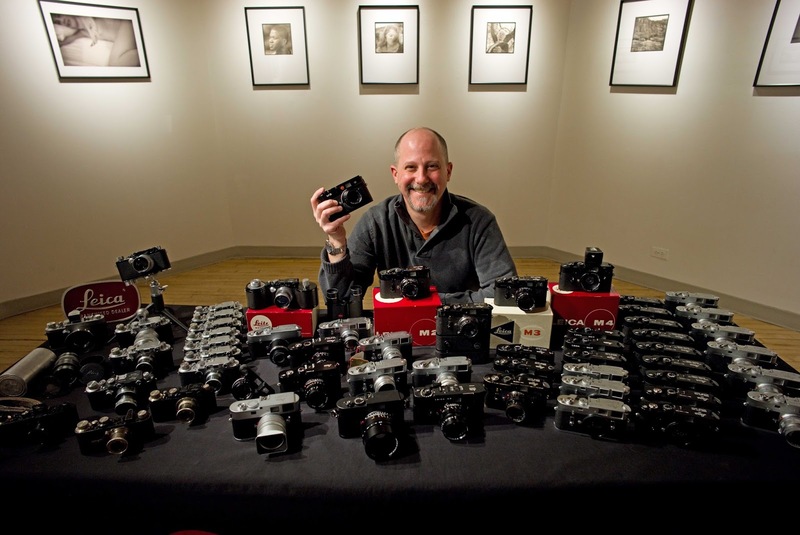 Doesn't Mr. Fricke have a huge Leica collection? 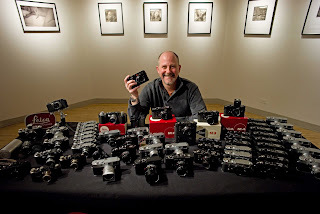 Yes, most likely the largest Leica collection in the US, if not the entire world. I thought that collection was sold to Leica Camera in Germany. Leica Camera did indeed buy a large Leica collection in the US, but the name of the original owner was never made public.